On 9 June David Howell gave a spell-binding seminar to a packed Centre for DIgital Scholarship: It’s a kind of magic: early results from Analytical Imaging in the Bodleian Libraries. After a tour through some of the fascinating and high profile conservation projects David has worked on, he turned to a history of analytical imaging techniques, the tricks our eyes use to make sense of the world around us, and, via the mantis shrimp and C5 BCE Persia, to Reflectance Transformation Imaging (RTI) and hyperspectral imaging. We were very grateful to colleagues from Special Collections for bringing items from the collections to illustrate David’s talk. Alan Coates, Rare Books Assistant Librarian, brought an incunable (a printed book from the earliest years of print), and Gillian Evison, Head of the Oriental Section, brought some of the oldest items in the Bodleian’s collection, the fifth-century BCE Arshama clay seals. Following the launch of Digital.Bodleian after years of work by Bodleian Digital Library colleagues the Bodleian Libraries’ Wikimedian in Residence, Martin Poulter, describes how images from this freely available resource are already being used to augment articles in Wikipedia in a post on our sister blog, Archives and Manuscripts at the Bodleian Library: “Digital.Bodleian + Wikipedia“. Find out how you can get involved! 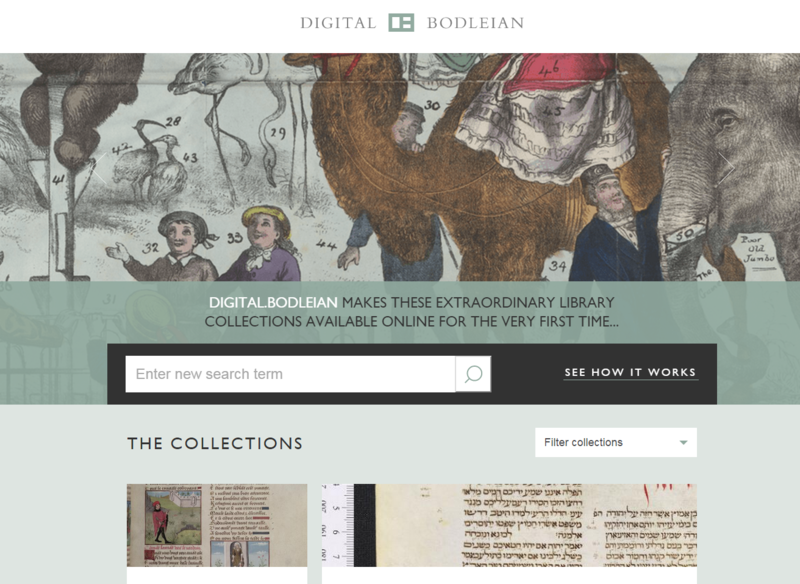 We’re very pleased to announce that our new unified digital collections platform, Digital.Bodleian, is now live. For the first time, it is possible to search and browse the Bodleian’s online special collections via a single interface. The site was launched on Wednesday at an event in the new Weston Library, with a lecture by Bruno Racine, president of the Bibliothèque nationale de France (whose Gallica is a well-established giant of digital library collections), and a speech by BDLSS’s own Lucie Burgess. Digital.Bodleian is IIIF-compliant, so you can view the manifest for any item, use the item’s UUID to open it in a IIIF viewer such as Mirador or Digirati’s Universal Viewer, and keep pace with future IIIF developments. Links to the IIIF manifest and the Universal Viewer are included in each item’s metadata panel within Digital.Bodleian. The content of the Bodleian Libraries’ diverse online collections, such as Luna, image.ox.ac.uk, and the Polonsky Foundation Digitization Project, is in the process of migration to Digital.Bodleian. Much of it is already there, and we hope to migrate the rest of it by the end of this year. Digital.Bodleian is interactive: you can tag and annotate items and build your own collections to download and export. The download package includes both the image (as a lower-resolution JPEG) and the metadata, but you can also download a JPEG of a portion of an image by right-clicking. For more information, please see the Bodleian’s press release about the launch, an article by BBC Oxford, and this Storify of DB tips. Also check out the next few weeks’ Twitter coverage by @bodleianlibs and @BDLSS. On 05 May 2015 an email was circulated within the Digital Humanities at the University of Oxford calling colleagues that were working as research software (including data) developers. The idea was to keep in touch, share experiences and learn from each other; as well finding similar roles when contracts end (as University of Oxford works a lot with fixed-term contracts). The Oxford e-Research Centre, Computer Science and the Digital Humanities are working to set up a University-wide network of “Research Software Developers” (RSDs): those who combine expertise in programming with an intricate understanding of research, and support the work of researchers in developing the (usually bespoke) software that is fundamental to so much of modern research. Many such people are employed across the University, but are not always well supported by cross-university structures. As a result they are often isolated and difficult to retain within the University. We are thus looking to connect these individuals in order to share expertise, provide appropriate advanced training, and facilitate re-employment with the University, hence optimising the use of their skills to enhance the University’s research. After a short survey was circulated and a mail-list had been formed, the first kick-off meeting happened on 8th June 2015. I participated in this meeting (as a team member of BDLSS) and below are some of my notes of the event. Looking forward, the discussion settled on 1-2 hour monthly meetings, lightning talks and discussions, and occasionally longer events. A few points were made about the importance of having a profile within the network to allow discoverability: not necessarily a whole CV, but basic information and links to your other profiles online (LinkedIn, Github accounts, etc.). On 25/06/2015 a Slack account was created, which you can join at https://rsdn.slack.com/signup/. The initial website for the Research Software Developers Network (Oxford RSDN) is at http://rsdn.oerc.ox.ac.uk. The next meeting of the network will be held on Tuesday 28th July at 9.30-10.30am in Lecture Theatre B in the Wolfson Building, Computer Science department. If you are interested, just come along. For more information on how to get involved visit http://rsdn.oerc.ox.ac.uk/.